Aimed at bringing street food to life, the Bird & The Bottle in Santa Rosa, CA is the end result of a pair of award-winning restaurateurs looking to blend a surprising array of flavors. Asian, American South, East Coast, Jewish and other cuisines have been combined to create an unforgettable menu. The menu at Bird & The Bottle features cocktails and an extensive wine list, and foods range from nibbles to larger plates. Everything has been chosen to pair well, and options include seafood favorites, poultry classics like matzo ball soup but also Korean BBQ chicken. There is a vegetarian menu with everything from fried cheese curds to smoked beets, but there are also pork and beef choices in abundance. A visit to Bird & The Bottle has to finish up with a dessert, and the "goo goo pie in another jar" is a must try. Pancho's Pride / What Pho? Try one of these cocktails in our giant shakers for the table! Great! Excellent food best dining experience in awhile! Great food and service. Imaginative dishes. Highly recommended. Visited here many times and it is always good. Will return. Although pricey, the food is great and we will eat there again when back in Santa Rosa. We especially enjoyed the crab cake hush puppies, salmon wings, and chicken liver moose. I was celebrating my birthday and they gave us a complimentary serving of fried sticky rice with vegetables. Everything was great! Love everything about Bird and the Bottle! Location, food, wine list, cocktails, and service are absolutely fantastic. Every Stark restaurant we've been to has been perfect!! Loved the restaurant! Really great service. Food is so delicious, very rich! Never any room for dessert! Highly recommended! Delicious food in an adorable atmosphere! The chicken and waffle was some of the best I've ever had. Busy place. A bit too noisy for my taste. The food and drink are excellent. I think I will save a return trip till it warms up enough to sit outside. Everything on the menu is fantastic. Small plates are perfect for sharing between 2 people. Service is quick. We love this place. Smokey poké and little gem salad, couple of artesian cocktails—does not get any better!!! Missing those Brussels sprouts! The asparagus did not compare. Always great service, great food. Consistently delicious. Nails the service, food, and ambiance points. Love taking friends here - always impressive! The Bird & The Bottle never disappoints. We chose B&B for our 41st wedding anniversary dinner, as it's one of favorite spots in Santa Rosa. Meal, as usual, was perfect for our tastes. Our server was exceptional, helpful, professional yet friendly. Kudos to her, and the entire staff, for making our experience special. Keep up the good work! Let me start off by saying that it is a cozy little place and the cocktails are absolutely delicious!! That part I would totally recommend. Based on the food that we had though I am not fully convinced. The poke with rice cakes was superb and I would eat that again and again. The crab hush puppies and the korean wings were totally blah and tasteless...the tapas size portions are of course tiny so if you are going to charge almost $20 per plate they better be amazing...and they weren't, unfortunately. We honestly would have tried more off the menu to see if maybe there were others that mirrored the poke in flavor and yummness factor but didnt want to spend any more money after the two duds. Had two cocktails each though as they were fantastic!! The food was off the charts good! Also, I ordered a Oaxacan Old Fashioned that is one of the best cocktails I've ever had in my life. And I finally found a place that can prepare octopus correctly after years of searching in vain. Delicious, creative small plates, helpful staff, lovely atmosphere. My only complaint is the noise level. First, this place is really loud indoors (even if not 100% full). Nice sunny deck if it's a nice day but on main street (4th St). Even in a corner, we raised our voices for entire conversation. Food is interesting, really well-prepared, spice/flavor-forward -- picky eaters won't like it, but everyone else will love the food. Very accommodating for various food issues our table had. Lovely, friendly server very knowledgeable about menu. Chairs must have been selected by large men -- none of us could put our feet on the ground (and noticed that was true for others around us including some normal-sized men). Seating was a bit of an issue for one person with a recent knee replacement. Go for the food!! On a nice day, sit on the deck. Was really noisy that we couldn’t hear each other. So they took us to upstairs and was better. Neighborhood favorite always! Top place on my list to take visitors to. Never disappoints! Worst service yet. The waitress disinterested in serving our table. willfully unapologetic for serving local well bourbon in a call drink only to say at least it was cheaper. And a little gem salad served incomplete without apples or dressing (at least not enough to taste). Overall a good experience tarnished by mediocre wait staff. Atmosphere was terrific! Food was amazing! Super flavor combinations! Our thanks to chef Nick!!!! Best brunch in the area! 10/10 would recommend it is amazing!! Food and cocktails were amazing and so delicious. I’m not a big veggi guy but the Charred Vegetables were outstanding. The Matzo Ball soup had the most flavorful broth of any I’ve ever had. The waitress was great, she had patience, helped us through our decisions and made wonderful suggestions. I recommended the Bird & The Bottle to several friends at our Cheese Festival event and they booked for the following night, with the same amazing experience. We had a good dinner. This was a birthday dinner for my husband. All of the staff was very friendly and pleasant. The food was delicious. The street tacos are a must. The acoustics are terrible here though. It was amazingly loud. We were upstairs with only maybe four tables in the room that we were in and we all had to talk really loudly to each other across the table. Our server didn't come by as often as we would have liked as well. Had to look for her and get her attention more than once. Friendly but not super attentive. Great restaurant and food. Not a great wine selection. Need more well known wines. Will bring my own next time. Overall, a very pleasant, delicious dining experience. Taking the Moroccan carrots off the menu was premature and extremely disappointing! We were told that they will be offered on the soon-to-be reopened Willie’s menu but no one knows when that will be. Why not continue satisfying your customers with that tasty dish until Willie’s reopens?! The waitress was wonderful! Knowledgeable about the menu and able to share with enthusiasm what her favorites are... we had a group there to celebrate a birthday and had an amazing time celebrating our friends day.... the octopus is my favorite and is always a winner when I encourage others to give it a try... cocktails are consistently delicious and carrot cake in a jar?!? Yes please🤤... the starks always do an amazing job with their restaurants... definitely check it out! It was a very enjoyable dinner. The only exception is the oysters. They were very small for 6 at $17. 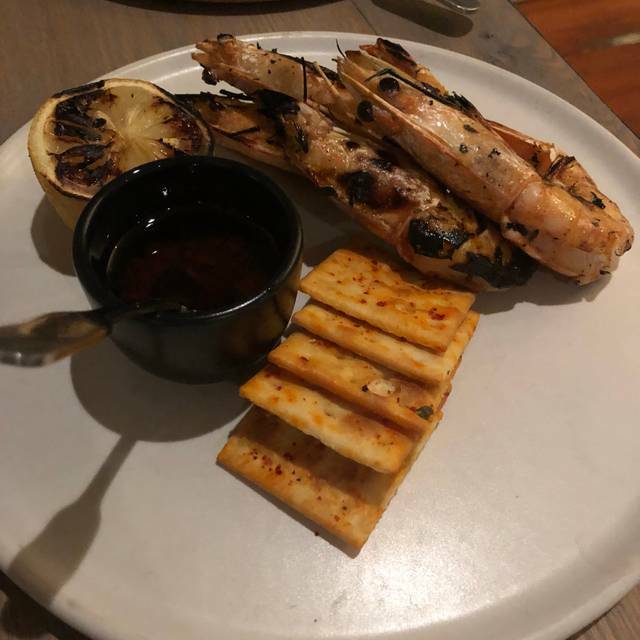 3 couples went for dinner which is the best way to experience B and B, just enough guests to share in the small plates, but not so many that you miss out on all the great food. We ordered 8 dishes a salad, Octopus, riblets, fried chicken, my favorite, especially the Nashville style, and steak street tacos for the table, just to name a few. Everything was excellent. The cocktails are very inventive, and really good. We had a nice bottle of wine as well. No dessert this time, but I will surely get the bread pudding next visit. Reservations advised !! We had a wonderful birthday date night and enjoyed every plate we ordered. Best Cobb salad ever! The pork belly is a special touch. The cod and dill appetizer was light and delicious. We added chicken sliders and lamb meatballs with roasted greens and everything was the perfect meal. I’ve never had a bad meal and the ambiance is fun! The food here is AMAZING!!! I've already recommend it to everyone I know!!! Overall, a very pleasant experience especially sitting in the front room with all of the windows. I look forward to eating outside in the summer. Great wait staff who were more than accommodating with moving us to a table by the window so we could visit. Disappointed they were out of the fried chicken... Great menu; small portions and no sides included....would prefer larger and a side. Wonderful, fresh brunch meal! The atmosphere was adorable. Service was great and I would definitely recommend for brunch or dinner.